Cape Dory Yachts was enjoying the tremendous success of its 19-foot Typhoon daysailer, designed by the venerable Carl Alberg, when the first Cape Dory 25 was launched in 1973. Fresh from the drawing board of George Stadel III, the larger sloop was meant to give the company an entry point into the red-hot cruising boat market. And it did just that. Stadel had already designed the Greenwich 24, a full-keel sloop built by Allied Marine. Cape Dory acquired the mold, so in many respects, the Cape Dory 25 became an extension of the earlier design. The association of both Alberg and Stadel with the same company has led to confusion over the years. Today, when a Cape Dory 25 is offered for sale, owners and brokers often claim the boat was Alberg's creation when, in fact, he was responsible for designing the Cape Dory 25D, which was launched in 1983, one year after the last Cape Dory 25 came off the assembly line. It was beamier, had larger volume, stand-up headroom below, and an inboard diesel engine, among other significant differences. Soon after the original Cape Dory 25 was introduced, Stadel went on to design yachts such as the Hans Christian 43, Shannon 38, Mariner Centaur 34 and Westwind 38. But his handiwork with the Cape Dory 25 had the longest-running influence, given that 845 were constructed at the company's yard in Taunton, Massachusetts, between 1973 and 1982, and many are still afloat. Traditional lines define the Cape Dory 25. A pleasant sheer, narrow beam and low freeboard add a touch of elegance to what is essentially a pocket cruiser. It looks like a fun boat to sail. And while the simple sailplan with a modest foresail and half-battened main might not seem expansive enough to get the boat cranking, sailors soon find out differently. The bronze portals can't be ignored, nor can the rare woods and masterful joinery found throughout the interior. The cockpit is roomy, suggesting comfortable daysailing, although crew movement could be restricted by the tiller. The Cape Dory 25 is solid and dependable. It's another one of those "back in the early days of fiberglass" boats with all the benefits of layered mat and roving applied by hand and bonded together with resin. A fiberglass inner liner provides an additional measure of security. The deck and hull are securely fastened together. Although the decks are cored with balsa, quality workmanship has warded off delamination in most instances. Deck hardware, including stanchions, rails and turnbuckles, is stainless steel, and the six portholes and through-hull fittings are bronze. Owners never worry the keel might fall off because there are no bolts to rust or break. The lead ballast is encapsulated, meaning it's molded within the hull. Like most older boats from a quality builder, the Cape Dory 25 can stand up to the passage of time if the equipment has been maintained. The extruded aluminum mast and boom could be pitted after exposure to weather for nearly 40 years, and the same goes for the jib and halyard sheaves, which may show signs of wear. Check the maststep on deck. The structural metal between the deck and headliner distributes the rigging load fore and aft. It's under constant pressure and any water trapped in this location may have caused deterioration. Many owners have abandoned the boom's roller-reefing system in favor of a jiffy or slab arrangement. If not, check the gooseneck fitting on the roller-reefing for wear. All through-hull fittings should be closely examined for proper closure. The hull is solid but the deck is constructed of balsa sandwiched between two layers of fiberglass. It should be checked for water infiltration and delamination. The deck layout on the Cape Dory 25 is straightforward. The aluminum mast is deck-stepped. A block at the end of the boom channels the 4-to-1 purchase system mainsheet to a traveler located at the aft edge of the cockpit. The cockpit is roomy but the tiller extends well forward, restricting crew movement while under way. "I've had four in the cockpit, but with a tiller the folks have to be sitting in their correct positions. Otherwise, someone is always having to move in order for the helmsman to steer," said Capt. Dana Vincent, owner of the CD25 Gladys Erzella. The cockpit is framed by two sail lockers and the lazarette, where the outboard motor is nested along with the portable gas tank. The foredeck with stainless steel bow pulpit is relatively cramped, but the roller furler makes sail changes unnecessary in most instances. A foredeck hatch provides illumination and ventilation. The coamings and handrails are teak in keeping with the boat's traditional appearance. Lines are controlled by a pair of Lewmar winches and adjustable jib fairleads on tracks. The Cape Dory 25 may be compact but it contains everything a cruising couple or small family might need. It sleeps four between the V-berth in the bow and single bunks to each side of the main cabin. The Porta-Potty head, located to port, has a privacy door. The companionway divides the galley, leaving the sink to port and the stove to starboard. An icebox keeps food and drinks cold. A small dinette table folds down. A hanging wet locker and storage compartments round out the amenities. Portlights illuminate the interior with natural light. A 24-gallon polypropylene water tank is tucked into the bow. Some boats owners had the optional wastewater holding tank installed during build. Heavy-duty flexible bags like those designed by Vetus can be installed under the sole or behind bulkheads to comply with new environmental laws. There's no getting around the fact sailors more than 5 feet tall cannot stand up in the main cabin. "You can stand if the hatch is open. It's nice because the bimini comes over the companionway," said William Atkinson Jr. of New Orleans, Louisiana, owner of a 1976 Cape Dory 25. Auxiliary power aboard the Cape Dory 25 is delivered by a long-shaft outboard motor of 5- to 15-horsepower that sits in a well in the lazarette. If repairs are needed, the small engine can be lifted out and brought to the dock. The full keel protects both the rudder and propeller. Most of these boats were fitted with two-stroke engines. Vincent installed a 5-horsepower Honda long-shaft, four-stroke engine. "I don't use it all that much," he said. "Mostly just to get in and out of the marina." Some owners have reported cavitation, particularly in a following sea as the boat gets lifted by waves, leaving the propeller revving in midair. Attributes most often singled out are the Cape Dory 25's ability to point high and handle almost any sea condition. Designed as a coastal cruiser, it has proven its ability for greater range. "I've been out in bluewater in the Gulf of Mexico with 10- to 15-foot rollers with no issues," said Atkinson. "I have a 150-percent genoa on mine. The boat has a hull speed of 5.9 knots and I can make 6.4"
Vincent, who has owned his Cape Dory for a decade, sailed the Pacific Coast south to Baja and the Sea of Cortez. "They're rugged boats," he said. "The best thing about the boat is she's weather capable, sturdy and well built." Vincent has larger two-inch diameter cockpit scuppers to improve drainage. "I got pooped while sailing solo off Baja and the water basically ran out the back engine mounting area," he said. The boat's low freeboard can make for a wet ride, but many sailors enjoy being close to the water. The Cape Dory 25 may well be the perfect pocket cruiser because it's affordable, trailerable, well built, has room for a small family and can handle most weather and sea conditions. As Atkinson attested, "It can take you anywhere." 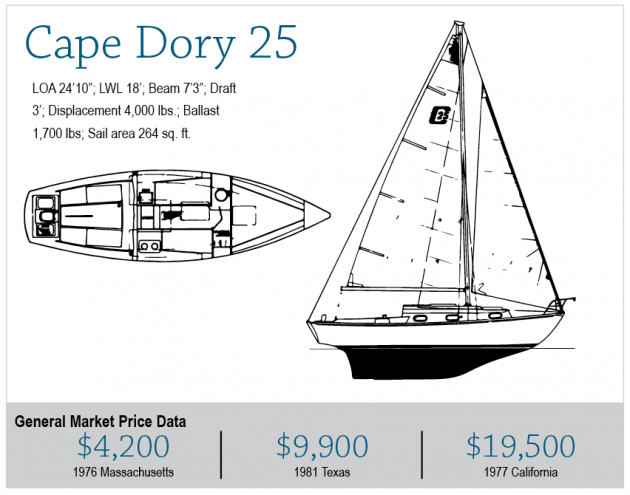 PRICE: Most Cape Dory 25s on the market fall into a relatively narrow price margin, averaging around $9,500. The boats were built over a nine-year span, so age and overall condition factor into the price. DESIGN QUALITY: The trailerable Cape Dory 25 was designed by George Stadel III as a traditional masthead sloop with full keel and attached hinged rudder. The design is perfect for a coastal cruiser for a small family or entry-level boat. CONSTRUCTION QUALITY: Cape Dory Yachts in Taunton, Massachusetts, built 845 Cape Dory 25s between 1973 and 1982. Its beefy hull construction with hand-laid fiberglass mat and roving bonded together with polyester resins has stood the test of time. The six portholes were high-quality bronze and all through-deck bolts had backing plates. USER-FRIENDLINESS: Cape Dory embraced this design because of its family-friendly rig and ease of handling. The foresail was intentionally cut small at 126 square feet. When paired with the 138-square-foot mainsail, it is a manageable arrangement even for less-experienced sailors. SAFETY: Like most boats built by Cape Dory, the fiberglass hull is thick and rugged, reducing concern about puncture during a collision or grounding. Two one-inch diameter scuppers drain the large cockpit. The encapsulated ballast is nearly half the weight of the boat, helping it remain upright in heavy winds or a knockdown. TYPICAL CONDITION: Given that the oldest Cape Dory 25s are now 40 years old, gelcoat crazing and spider cracks are to be expected. Some owners have reported blistering but not enough to require complete hull refinishing. The aluminum mast and boom are prone to pitting. REFITTING: Some owners have relocated the traveler from behind the tiller to the coachroof and replaced the roller-reefing main with slab or jiffy reefing systems. AVAILABILITY: Of the 845 built, most are still sailing and more than 25 are currently on the market across the United States and southern Canada. INVESTMENT AND RESALE: The relatively modest price for a used Cape Dory 25 tends to keep this boat in demand, especially among sailors looking for a first-time cruising boat.